Researchers from the Leibniz-Forschungsinstitut für Molekulare Pharmakologie (FMP) have found a new method for obtaining high-quality images in magnetic resonance imaging (MRI), that requires less contrast medium compared to current methods. It is made possible by using an "elastic" protein structure that can absorb dissolved xenon in a self-regulating way: The greater the amount of this noble gas, the higher the quality of the image, without the need to adjust the amount of contrast medium applied. The researchers have been working for some time in developing contrast media based on xenon, a harmless noble gas. The group employs a process with powerful lasers in which the xenon is artificially magnetized and then—even in small quantities—generates measurable signals. To detect specific cellular disease markers, the xenon has to be bound to them for a short time. In a cooperation with scientists from the California Institute of Technology (Caltech) funded by the Human Frontiers Science Program (HFSP), Dr. Leif Schröder and his team have now looked into a new class of contrast media that binds the xenon reversibly. These are hollow protein structures produced by certain bacteria in order to regulate the depth at which they float in water, similar to a miniaturized swim bladder in fish but on a nanometer scale. The research group led by cooperation partner Mikhail Shapiro at Caltech introduced these so-called "gas vesicles" some time ago as MR contrast media. However, it was not yet known how well they could be "charged" with xenon. 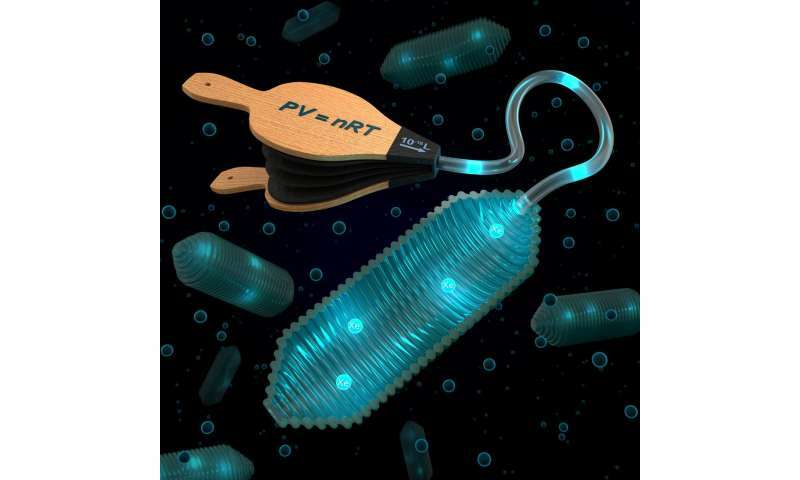 In the study, which has been published in ACS Nano, both groups now describe how these vesicles form an ideal contrast medium: They can "elastically" adjust their influence on the measured xenon. "The protein structures have a porous wall structure through which the xenon can flow in and out. Unlike conventional contrast media, the gas vesicles always absorb a fixed portion of the xenon that is provided by the environment, in other words also larger amounts if more Xe is provided," Dr. Leif Schröder reports. This characteristic can be employed in MRI diagnostics, because more xenon must be used in order to obtain better images. The concentration of a conventional contrast medium would also need to be adjusted in order to achieve a change in signal for all the xenon atoms. The gas vesicles, on the other hand, automatically fill up with more xenon when this is offered by the environment. "They act like a kind of balloon, to which an external pump is attached. If the balloon is 'inflated' by xenon atoms flowing into the gas vesicle, its size does not change, but the pressure does increase—similar to a bicycle tire tube," explains Dr. Leif Schröder. Because much more xenon passes into the vesicles than with conventional contrast media, the xenon atoms can then be read out much better after they have left the vesicle again and show a changed signal. This way, the image contrast is many times higher than the background noise while the quality of the image is significantly improved. These contrast media can thus also be used to identify disease markers that occur in relatively low concentrations. During the further course of the cooperation, the two groups intend to test these contrast media in initial animal studies. The newly discovered behavior will be a decisive advantage in order to use these very sensitive contrast media in living tissue as well. Dr. Leif Schröder and his team were able to make the first MRI images with particle concentrations one million times lower than those of the contrast media currently employed.